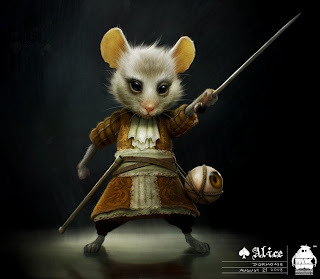 The LA Times blog has an interview with one of the character development artists who worked on Tim Burton's film, Michael Kutsche, who we've mentioned before, here and here. UK readers may be interested in details on a Mad Hatter Benefit Party happening at Jamm in Brixton. If you live in the California Bay Area, you'll probably be interested in signing up for a ticket giveaway to see Alice in Wonderland at the Kabuki Theater in San Francisco.